Mirador: It’s all about the views … from sunrise to sunset. You can spot whales, rays and many birds from here. The view up the coast is spectacular with Tetakawi dominating the scene. 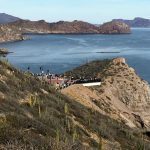 The Mirador gives you a fantastic vantage point for viewing the beauty of San Carlos and the twin-peaked Tetakawi, especially during sun-sets. Tour Guaymas: Wander this water-front town, seeing the sites. Old Jail: The old City Jail is one of Guaymas’ most important and distinct landmarks. Now offers guided tours and art shows. The Guaymas Pearl Farm has 200,000 oysters under cultivation. The oysters produce an iridescent pearl – the most valuable in the world. Learn about the Guaymas Pearl Farm, including video and contact information.